Sr(Ti1−xFex)O3−δ (0 ≤ x ≤ 0.2) thin films were grown on Si(100) substrates with LaNiO3 buffer-layer by a sol-gel process. Influence of Fe substitution concentration on the structural, ferroelectric, and magnetic properties, as well as the leakage current behaviors of the Sr(Ti1−xFex)O3−δ thin films, were investigated by using the X-ray diffractometer (XRD), atomic force microscopy (AFM), the ferroelectric test system, and the vibrating sample magnetometer (VSM). After substituting a small amount of Ti ion with Fe, highly enhanced ferroelectric properties were obtained successfully in SrTi0.9Ti0.1O3−δ thin films, with a double remanent polarization (2Pr) of 1.56, 1.95, and 9.14 μC·cm−2, respectively, for the samples were annealed in air, oxygen, and nitrogen atmospheres. The leakage current densities of the Fe-doped SrTiO3 thin films are about 10−6–10−5 A·cm−2 at an applied electric field of 100 kV·cm−1, and the conduction mechanism of the thin film capacitors with various Fe concentrations has been analyzed. The ferromagnetic properties of the Sr(Ti1−xFex)O3−δ thin films have been investigated, which can be correlated to the mixed valence ions and the effects of the grain boundary. The present results revealed the multiferroic nature of the Sr(Ti1−xFex)O3−δ thin films. 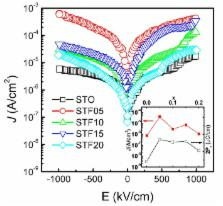 The effect of the annealing environment on the room temperature magnetic and ferroelectric properties of Sr(Ti0.9Fe0.1)O3−δ thin films were also discussed in detail. Why Are There so Few Magnetic Ferroelectrics? The protein hydrolysate, Primatone RL, is a cost-effective multiple growth promoter of mammalian cell culture in serum-containing and serum-free media and displays anti-apoptosis properties.